When should I have my racket restrung and what string and tension should I ask for? The answer to the first part of your question is if the string is not broken then roughly every 6 months. The longer the string has been in your racket the more tension you will have lost and the more worn and damaged the string will have become. Just because the string has not snapped does not mean that your string is still effective and good for purpose! Another consideration is the type of player you are and if you had the original string that the racket was sold with, is it appropriate string and string tension for you and your style of play? The quicker the court surface the looser the string tension, i.e. A grass court is one of the quickest surfaces and a shorter backswing is require to consistently time the ball in front of the body as the ball travels very quickly off the surface and is harder to time. Looser strings work as a catapult and propel the ball back, which tight strings would not do. The size of your racket head – When you string a small racket head (90-95 square inches) and a large racket head (105-115 square inches) at the same tension the larger head will feel looser and therefor needs to be strung tighter. The width or gauge of a string - The average width of a string is 1.3mm but the approximate range is 1.18-1.40mm. The narrower string will feel tighter than the wider string strung at the same tension. The cost of the restrings will normally range between £15-£35 and this is solely dependent on the quality of the string used. A good idea is to ask your restringer what string they use and the cost then do some research as to the quality and cost of the string they offer. "I never seem to have time on the return of serve to swing and drive the ball and usually end up blocking defensively or trying to swing and making a horrible miss-hit. What can I do to help me drive the return more effectively?" Where do you stand to receive serve and are you considering the quality of your opponents serve? The basic rule of thumb is the faster the serve is the further back you stand to receive, although we must be aware of the greater angles created when we stand further back. Make sure you are giving your opponent’s serve the respect it deserves and stand appropriately. You must also be aware of your opponent’s favourite serves (these are known as patterns) and so start anticipating certain serves in certain situations. For example a left-hander at 30-40 or 40-30 will generally serve out wide to the backhand and this is his/her “go to” serve and in general a pattern. What court surface are you playing on? The faster the court surface you play on the harder it is to drive the return as you will have less time, likewise the slower the court surface the easier it is to drive the return as you will have more time. The recognised faster surfaces are grass, carpet and some very smooth cement and acrylic hard courts. The slower surfaces are clay and most hard courts. Indoor courts, regardless of surface, will always seem a bit quicker. Are you receiving a first or a second serve? The answer to 1 applies to the first serve but when receiving a second serve there is also spin to consider and also the confidence level of your opponent. What I mean is if your opponent’s serve is weak stand inside the baseline and put some psychological pressure on them, this wont help to improve the quality of your drive return but force the server into more missed second serves so giving you more easy/free points. Are you using a split step and are you timing your split step relative to your opponents serve? The split-step throughout your game is the difference between you having time and balance on the ball or not! On the return it allows you to load, which engages your legs, and to move positively to the ball making you more responsive and reactive. This creates time on the ball. You should make your split-step just as the server is about to make contact with the ball, this timing is very much key to a successful drive return. Most of today’s professional players split step forward and this helps to drive positively. A forward split step initiates forward momentum and gets body weight moving into your return. When should you start to track your opponent’s serve? You should track the ball from the servers hand and ball toss. The way in which the server stands can give you an idea of the serve they will hit also the placement of the ball toss also helps you anticipate and read the direction and type of serve you will receive. Is your technique resilient enough to drive the return? To drive the return off both sides your technique must be sound. Try to be objective about this and if necessary have a session with a good technical coach to brush up. Do you abbreviate the backswing on your return? Most players who drive the return will abbreviate/shorten their backswings and which allows them to make, on a more consistent basis, a point of contact in front of their body. This is what most people call good timing but good timing is just a contributing factor to regularly driving the return well. What grip should you wait to return with? Wait to receive serve with your most uncomfortable grip, the one that is most un-natural and hard to find. Nearly all players with a double-handed backhand wait to receive with their forehand grip as the non-dominant hand will plays the 2 handed backhand. For example Rafa waits to receive with his forehand grip but is still able to drive the backhand return as his non-dominant hand plays the double-handed backhand. Single-handed players are split with which grip to receive with and some wait to receive with a forehand and some with a backhand grip. If your strength is speed and fast feet you can wait to receive with the grip of the side you would prefer to hit, but this means you will need many of the skills and qualities we have already mentioned. When you watch the return of professionals you will see many pro’s hitting second serve returns with their forehands even when the server is directing the serve towards their opponents backhand. "When I play doubles I never really know where to stand as the returners partner or the servers partner. I know I should be looking to volley but on TV sometimes the players stand close to the net and sometimes behind the service line? Where should I stand?" "Great question and I am sure one that is in the back of many a club doubles player’s mind! Firstly I should say that on TV the professional players have so many different variations of where they stand and these are relative to the strategies and formations they are using so sometimes the pros can be a little bit confusing. Let me answer this as a rule of thumb. As a receivers partner one should stand on or around the service line and I would say within a metre of the centre line. 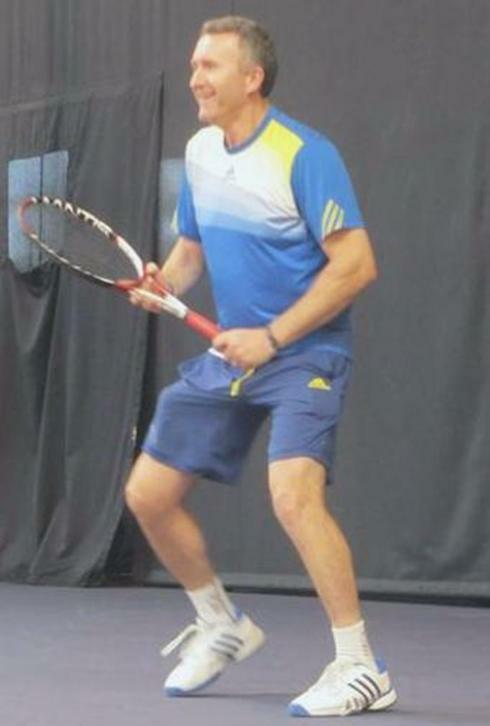 There is a range of acceptability here depending on how fast the serve is (on a faster serve you may stand slightly further back and on a slower serve you might look to move forwards), how good your partners return is (if your partner is defensive on the return you may move further back but as with a slower serve if your partner is aggressive on the return and is able to keep the ball away from the servers volleying partner you may look to move forwards). 1. Move forward and split step looking for the receivers return to volley/intercept (it’s always easier to volley if you have forward momentum, stationary volleying seems always to be alittle more defensive and late). 2. Have a better position to move across and intercept (this is reliant on good communication between server and partner). 3. Have a better position to cover the return down the line (again reliant on communication). When I talk about having better position to hit specific shots this is very much dependant on game plan and good communication between the server and servers partner. For example if the server says he will serve down the T the servers partner can now split forwards and across toward the T as the likelihood is the return will not pass the volleyer down the line and will probably go down the middle giving the servers partner the chance to intercept with a volley. As I mentioned earlier all of the above is open to interpretation and is affected by other variables so during a match one should be continuously adjusting positioning which could also be affected by the stage of a match, the fatigue of players including you and opponents, the score, mental and psychological state of mind of all players on court, The speed of the court surface, the weather conditions and the tactics being employed."